This Web page lists Flash Techniques from Techniques for WCAG 2.0: Techniques and Failures for Web Content Accessibility Guidelines 2.0. For information about the techniques, see Introduction to Techniques for WCAG 2.0. For a list of techniques for other technologies, see the Table of Contents. Flash player is often used to display video, and it provides support for text tracks which can be used to provide closed captions or subtitles in any language, and it also support multiple tracks of audio, thereby enabling support for video description, and support for multiple video tracks, enabling the delivery of sign language interpretation for audio-visual content. Adobe continues to improve accessibility support in Flash Player. In March 2010 Adobe announced plans to add support for IAccessible2 and support for accessibility APIs for both Mac and Linux platforms. 3.1.1 Language of Page - The language of Flash content is established by the lang attribute of the containing object element in HTML, not within the Flash SWF file itself. Authors may include more than one Flash SWF in a single web page, each with a different language indicated in the object element's lang attribute. See FLASH13: Using HTML language attributes to specify language in Flash content (Flash) . JAWS 8.0 or later can be configured to change language automatically on the basis of the lang attribute. 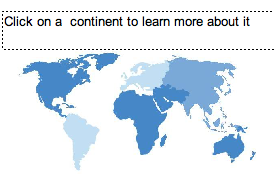 However, it only switches amongst major languages as indicated by the primary code. If a regional language variant is indicated with a language subcode, JAWS will use the default variant for which it is configured. To create a custom reading order, assign a tab index value to every instance on the stage, either through action script or through the Accessibility Panel. 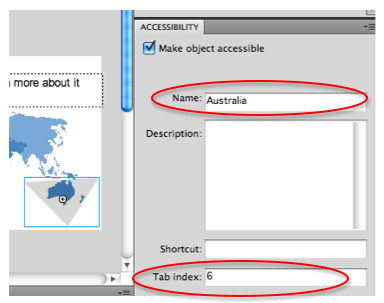 Create a tabindex value for every accessible object, not just the focusable objects. 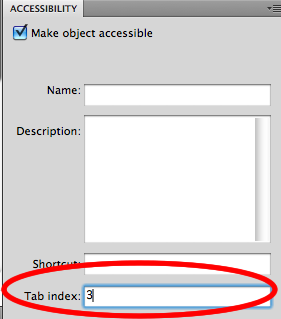 For example, dynamic text must have tab indexes, even though a user cannot tab to dynamic text. When focus has been placed inside the Flash movie, press the tab order repeatedly to traverse its contents by keyboard. The objective of this technique is to demonstrate how to invoke a scripting function in a way that is keyboard accessible by attaching it to keyboard-accessible, standard Flash components provided by the Adobe Flash Profressional authoring tool. In order to ensure that scripted actions can be invoked from the keyboard, they are associated with standard Flash components such as the Button component. The click event of these components is device independent. While the "CLICK" event is a mouse event, it is actually mapped to the default action of a button. The default action occurs when the user clicks the element with a mouse, but it also occurs when the user focuses the element and hits the space key, and when the element is triggered via the accessibility API. The objective of this technique is to allow keyboard focus to move to and from Flash content embedded in a web page. In browsers other than Internet Explorer, there is a problem related to keyboard accessibility of embedded Flash content. The problem is that, while both the Flash content and the HTML content around it may be keyboard accessible, it is not possible to move keyboard focus between the Flash content and HTML content without using a mouse. Once focus is placed inside the Flash movie, a keyboard user will be trapped there. Similarly, when focus is placed somewhere else on the HTML content (outside the Flash movie), it will be impossible to move focus into the movie. 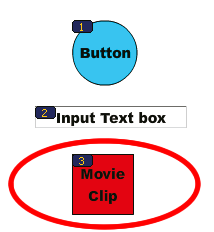 This is demonstrated in the working example of Providing a button in the HTML before the Flash object to stop sound. The working example of Providing a button in the HTML before the Flash object to stop sound is available. This is demonstrated in working version of A thick blue border to indicate focus. The working version of A thick blue border to indicate focus is available. 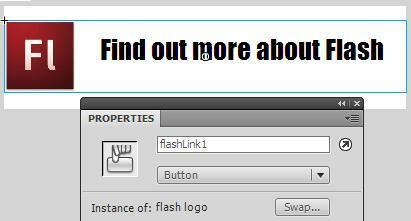 Use a tool which is capable of showing an object's accessibility name, such as aDesigner2 to open the Flash movie. 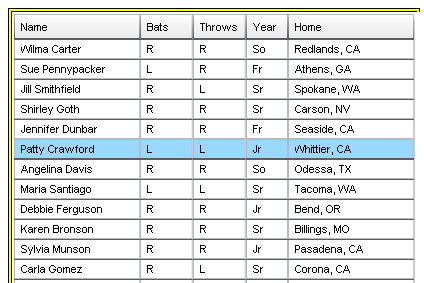 The objective of this technique is to provide an accessible name to the built in form components provided by Flash. 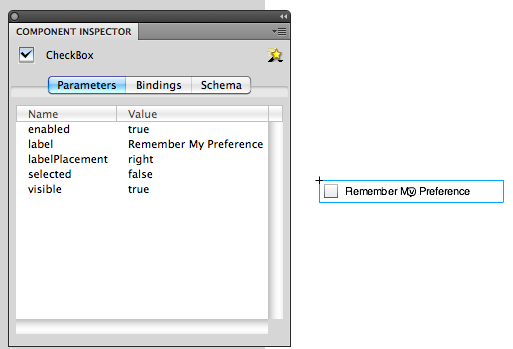 Some components, such as radio buttons, checkboxes and buttons, have their own 'label' property. For other components, the developer needs to specify the component's label text as accessible name. This can be either be achieved through the Accessibility panel (for components placed on the stage during authoring) or through scripting (for components that are dynamically created at runtime). In Flash, such groupings of characters can be made accessible by wrapping them in a MovieClip, and providing an accessible name. It is crucial that the the forceSimple property for the MovieClip is set to true also. This will hide the actual ASCII characters from assistive technology. This example is the same as example 2, except using ActionScript instead of the accessibility control panel in the Flash Professional authoring tool. Ensure that the textual descriptions for each form control within the flash application is placed adjacent to the control itself. Text eligible to be used for auto-labeling must not be set to be hidden from assistive technology. Select the movie stage, and open the 'Accessibility' panel. 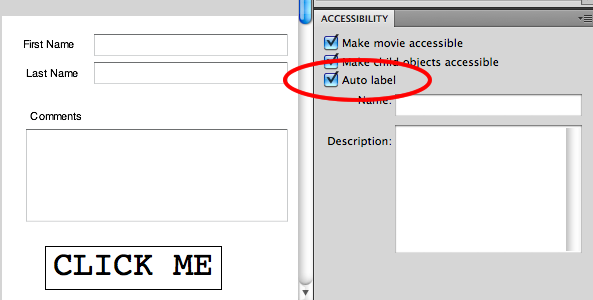 If the auto label behavior is inappropriate to your Flash content, uncheck the 'Auto label' option, and ensure that each control receives a meaningful 'name' value in the 'Accessibility' panel. 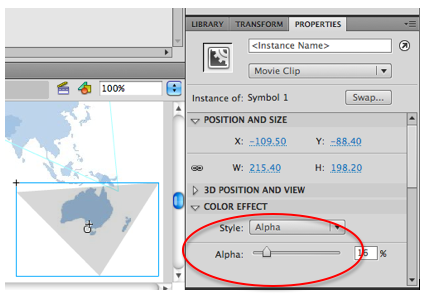 To disable auto labeling for a particular object but not the whole movie, convert the text to the 'dynamic text' type using the 'Property inspector'. 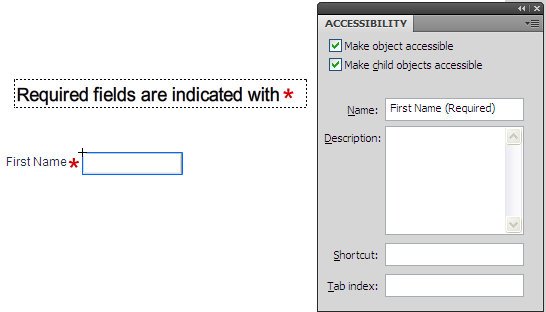 Then select it, and uncheck its 'Make object accessible' option in the 'Accessibility' panel.